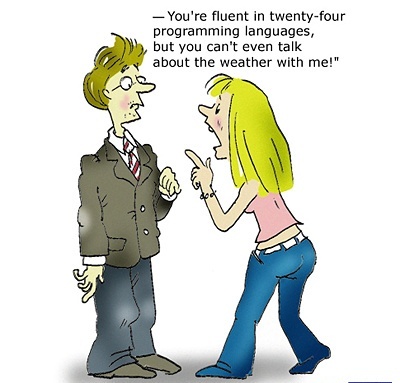 KnowCrazy.com: Software engineer and his wife .. Husband - hey dear, I am logged in. Wife - would you like to have some snacks? Husband - hard disk full. Wife - have you brought the saree. Husband - Bad command or file name. Husband - erroneous syntax, abort, retry, cancel. Wife - hae bhagwan !forget it where's your salary. Husband - file in use, read only, try after some time. Wife - at least give me your credit card, I can do some shopping. Husband - sharing violation, access denied. Wife - I made a mistake in marrying you. Husband - data type mismatch. Wife - you are useless. Wife - who was there with you in the car this morning? Husband - system unstable press ctrl, alt, del to Reboot. Wife - what is the relation between you & your Receptionist? Husband - the only user with write permission. Wife - what is my value in your life? Husband - unknown virus detected. Wife - do you love me or your computer? Husband - Too many parameters.. Wife - I will go to my dad's house. Husband - program performed illegal operation, it will Close. Wife - I will leave you forever. Husband - close all programs and log out for another User. Wife - it is worthless talking to you. Husband - shut down the computer.